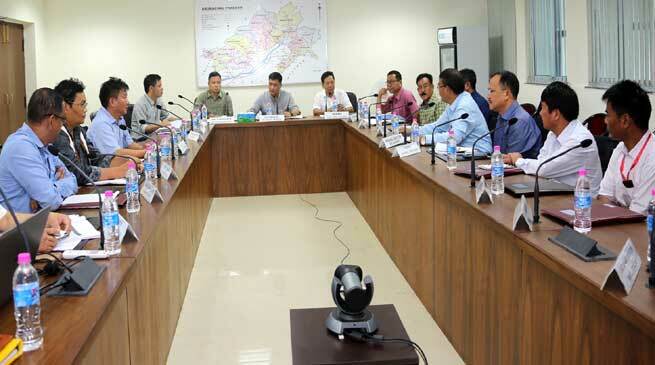 Chief Minister Pema Khandu today resolved to restructure the Sports Authority of Arunachal (SAA), which is a registered body functioning under a Memorandum of Association since 2005, by an Act to be passed by the state legislative assembly. Chairing a meeting of the SAA Governing Body here this morning, Khandu directed the sitting Chairman of SAA, Bamang Tago, in consultation with the department of Sports and Youth Affairs, to frame a blueprint of the Act and place it before the government for further perusal. This he said is required to give a distinct shape, role and responsibility to the autonomous body so that it can work constructively in the field of promoting sports and nurturing sportspersons from across the state. Going through the roles and functions of the existing SAA set-up, Khandu lamented that the sports body has not been able to live up to expectations because of various flaws in guidelines under which it was constituted. He lauded Tago for bringing it to the notice of the Governing Body, which incidentally met today after a gap of 5 years, and admitted the need to give greater autonomy to SAA. He also appreciated Tago for referring the Mizoram State Sports Council Act 2002 as an example that could be replicated in Arunachal Pradesh. “If Mizoram can bring an Act to successfully run an autonomous sports body, we can too. Hence, I request SAA and the department of Sports and Youth Affairs to properly study the Mizoram Act and frame one keeping in consideration the requirements of Arunachal Pradesh for placing it in the Assembly as a bill,” Khandu advised. Khandu observed that with an Act in place the autonomous sports authority will have its role, responsibility and power in clear terms and all confusions with its relation vis a vis the department of Sports and Youths Affairs and state level sports associations will be cleared. The Chief Minister also appreciated the initiatives taken up by the Sports Authority of India (SAI) for promotion of games and sports in the state. While thanking SAI Regional Director from Guwahati, Dr Subhash Basumatary for his presence in the meeting as a co-opted member, Khandu assured state government’s support in his endeavours in the state. He expressed happiness that SAI has agreed in principle to establish SAG centers at Roing, Aalo and Miao besides the ones at Itanagar and Rupa. Further, he accepted the proposal put in by Dr Basumatary to utilize existing badminton infrastructure in the state capital to temporarily run the Dorjee Khandu Badminton Academy till the time its permanent infrastructure comes up near Naharlagun. When informed that sportspersons after getting employed in government departments under sports quota are forced to leave their playing profession, Khandu viewed that they should be allowed to practice and participate in competitions as they used to before employment till their age permits. He asked the department to come up with a guideline to ensure it. Sports and Youth Affairs Parliamentary Secretary Nyamar Karbak informed that a state sports policy is in the making and after its finalization and implementation the road ahead will be crystal clear. He however emphasized on starting from ground zero and move upward instead of planning from the top. Legal Metrology & Consumer Affairs Parliamentary Secretary Laisam Simai, a co-opted member of the Governing Body, suggested that impartiality of the highest level should be maintained in giving opportunities to budding sports talents so that only the best of the best can go ahead to represent the state and the country in competitions. Other issues like requirement of coaches, physiotherapists, instructors, administrators as well as budgetary allocation were discussed in the meeting. The 2nd Governing Body meeting of SAA was also attended by the SAA Vice Chairman, Secretary Sports and Youth Affairs, Secretary APP Sports Board, Directors of Sports, Youth Affairs and State Plan, Member Secretary SAA, representatives of SBI, NEEPCO and NHPC and distinguished sportspersons Gumpe Rime, Tadang Minu and Tamat Gamo.